Thanks Rocky, I will keep at it and keep asking questions! Going flying this morning and then more welding practice this afternoon. Have a good rest of the weekend. Finally the questions: Do you always push the nozzel when using steel wire and gas vs flux core wire? Does the thickness of the metal make a difference? And visa versa, do you generally always drag when there is slag? Also, any suggestions on how to keep the stickout constant? I am having trouble keeping that nozzel the same distance from the metal and I am getting some popping. I recognize it will take time and practice, but I would like to avoid bad habbits from the start if possible. Thanks. Welcome to the forum sport, there's lots of good information here, and we have some fun, too. So join in with your questions, and share your experience. There is no such thing as a dumb or stupid question...we have all had them at one time or another....glad to have you aboard! Yes, always push solid wire. Thickness makes no difference. When there's slag, you drag. Goes for stick welding, too. Practice, makes holding stickout constant. Same for nozzle...sounds like you have a good start, already! Last edited by Rocky D; 08-31-2009, 12:52 AM. I am extremely new to welding. Always been a wood person and intimidated by metal. I decided it was time to get over it, so I purchased a Hypertherm Max 30 plasma cutter and a Miller 211 along with other stuff like a Hobart helmet, gloves etc. I got the welder a week ago, modified a cart so all stuff would fit and started practicing yesterday. Some OK welds but many looked like chewing gum. I was welding on thin 20 guage metal since it was handy. Today I will practice on some 1/8 inch stock and hopefully do better with less burn throughs and less warpage. I mainly want to make yard and garden art, but may need to weld thinner stock such as sheet metal down the road. I am glad I read this post since I was pulling the nozzel towards me instead of pushing it. A freind (uses a flux core welder) suggested that method. I am not welding with Flux core wire, although I may one day. The welder came with steel .030 wire and I purchased a medium size cylinder that I had filled with an argon/Co2 mix. 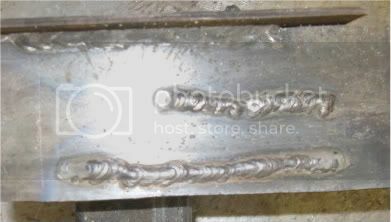 Your middle bead looks like your doing a weave, stopped in middle then resumed welding with another weave. At start of each of these welds your not pausing/slowing down long enough at side to let puddle catch up. Rocky didn't show the pauses at side of his weave pattern drawing which he sometimes does. You can't sharply see all details of puddles at once because eyes only see very small spot sharply and you don't have experience to understand what your seeing. Scan the puddle. Puddle leading edge shows penetration. In front of puddle you see your on track. Don't look at arc. When your welding spend most of time looking at rear of puddle seeing consistent bead arc and ripples. At side of weave pause to see puddle catch up and have even side with tie in to side with no undercut. For a couple of welds concentrate a little more on one thing. Then make one needed change for another weld or 2. This way you can see and understand how/why weld improved or got worse. When making wire speed change at first make big changes so you can see how weld bead changes. Then you can make smaller changes. With switched volt taps your making big changes you can see in weld. If your welder has infinite voltage adjustment beginners should also make big voltage changes not waste time with small changes. At first change wire speed or volts so you can see what happens to weld. If your using solid wire with shielding gas, try making weld without shielding gas. That way you will know how weld looks and whats wrong when gas runs out or you forget to turn on shielding gas. You get weld consistency by having dance like rhythm that feels and looks right. MIG welds have tendency to have cold starts. Experienced welds start a little in front of desired start point and quickly go back about bead width to desired start point. They fill in end of bead crater with quick forward back forward motion they hardly think about. Lets say your stringer no weave weld bead is 1/8 inch. 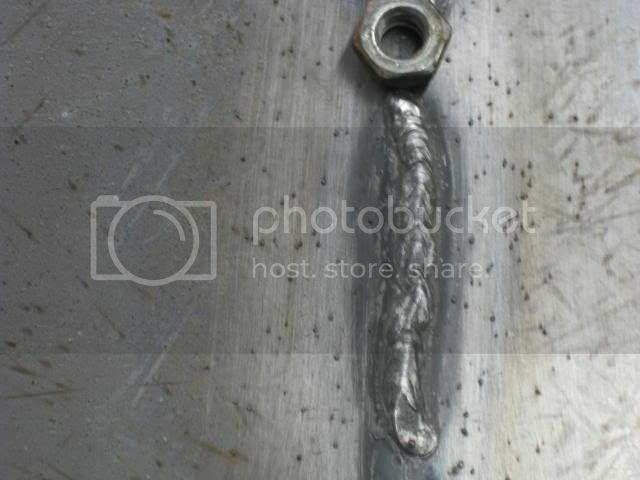 Your weld bead with weave should be less than twice that width. 1.5 width of stringer bead or less is better. Your bottom bead looks better, more consistent and will get better with practice. Is top bead at edge of plate a corner joint fillet weld? Need to direct weld more into vertical plate at about 45 degree angel as shown in welders manual. He war referring to the elongated hole in the end ot the tip.When that happens, it will cause sputtering and spitting. Then you change the tip. 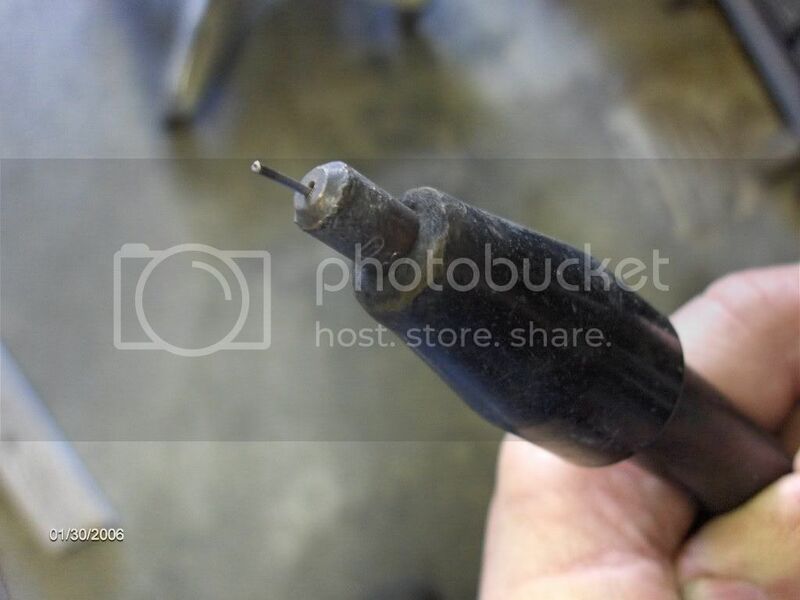 Even though the tip in the picture is slightly elongated, it still was welding fine. it takes quite a while to elongate a tip, so for the hobbyist, it would be good to have a couple of extras on hand. I think they come in packs of 5, and that would be plenty. As I recall, when I was production welding in the shipyard, I would go through a tip every three 10# spools. C is ok for pattern, there are lots of others, depending on position, and joint config. It's also ok to just not use a pattern and just keep a steady speed and straight. Draw lines the width of the bead you want on the steel first with soapstone...helps to keep you from wandering. The saying is: "when there's slag...you drag" for fluxcore drag or pull the puddle. for MIG (with gas) you push. With the tip between 1/4" to 3/8" stickout. It's important to keep it even as you travel, because the distance affects the volt/amp ratio. The is a fluxcore nozzle that will allow the contact tip to protrude out farther all by itself to give you a better look at the puddle. Never welded with them 7/8" ones eh? Living proof that LWS counter-monkeys are not brain surgeons! Once I was buying a 50# can of 1/8" 7018 Rods easy enough just go get it and bring it to the table right. Well sort of except the salesmen of about 30 yrs old told me he didn't have any 7/8" Welding Rods. I had to explain in great detail while in pain what I was refering too. To add injury to insult I have seen this guy in there a couple of times so he wasn't new. "Don't believe anything your hear and only half of what you see" works for me. Last edited by FWI; 09-13-2009, 07:04 AM. More ignorant lying by clueless LWS countermonkeys. The HH210 is not "discontinued," in fact it's only recently released. The nozzle IS available, the Hobart number is #770 487 and the Miller number is #226 190. Hobart parts are certainly NOT "discontinued Miller products." Shouldn't you be making some pork sizzle instead of steel?